As has already been documented on the blog, TBC have been working on a new performative drawing piece in response to the space of Catherine Wheel Alley off Bishopsgate in London. We have uploaded a PDF to WordPress documenting our research into the relationships between drawing, space and performance. The PDF also details the parameters we allowed ourselves to work in, such as the materials we considered using and different approaches we had to exploring the space. It is hoped that with the dimensions provided by Asif Kanji for the tunnel on the Lahore Slice, we will produce a similar drawing in London in response to that space. We thought that the description of the tunnel drew parallels with Catherine Wheel Alley, narrow, littered and a thoroughfare to the station. TBC Artists’ Collective in London have a couple of questions for the artists in Lahore – any help would be much appreciated. We are making a publication to document the research, ideas and drawings we are making for Slice. The publication will be made in an edition of two, one of which we’ll archive in the British Library in London, and the second we’d like to deposit in an archive in Lahore. Could you make any suggestions of relevant places we might send the publication? Secondly, during the meeting on Saturday Zahra showed us some photographs of the ten places on the Lahore slice that you are working with. One of the places is a pedestrian tunnel that has some similarities to the passageway that we are working with. Could one of you provide us with the measurements of the inside of the tunnel? Bebe, Charley, Laura and Paul • TBC Artists’ Collective. Yesterday TBC Artists’ Collective completed the first stages of their contribution to Slice. 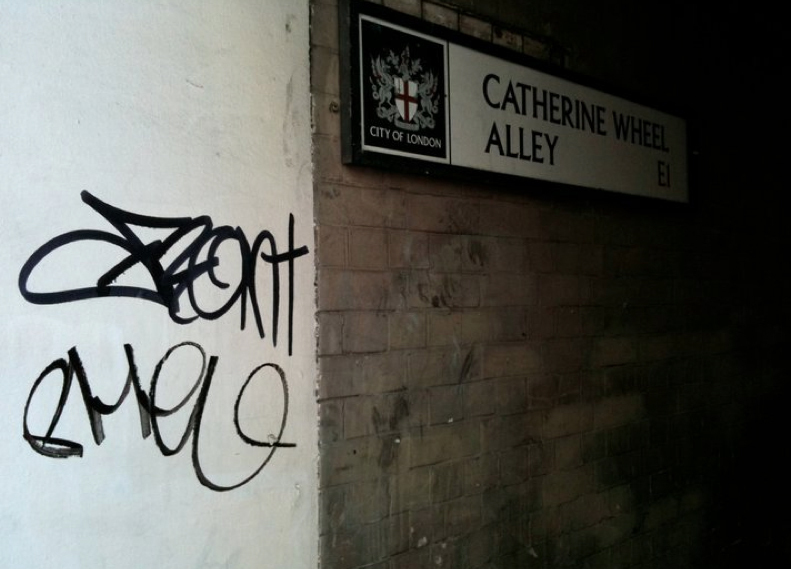 Filmmaker Timothy Knights, Photographer Valerie De La Rochette and TBC Intern James Tuitt documented the work made on location in Catherine Wheel Alley, London E2. TBC members Beverley Bennett, Charley Peters, Laura Davidson and Paul Mendez are collaborating to create a performative drawing responding to the physical features of the narrow passageway, which lies close to Liverpool Street Station at the start of the London slice. 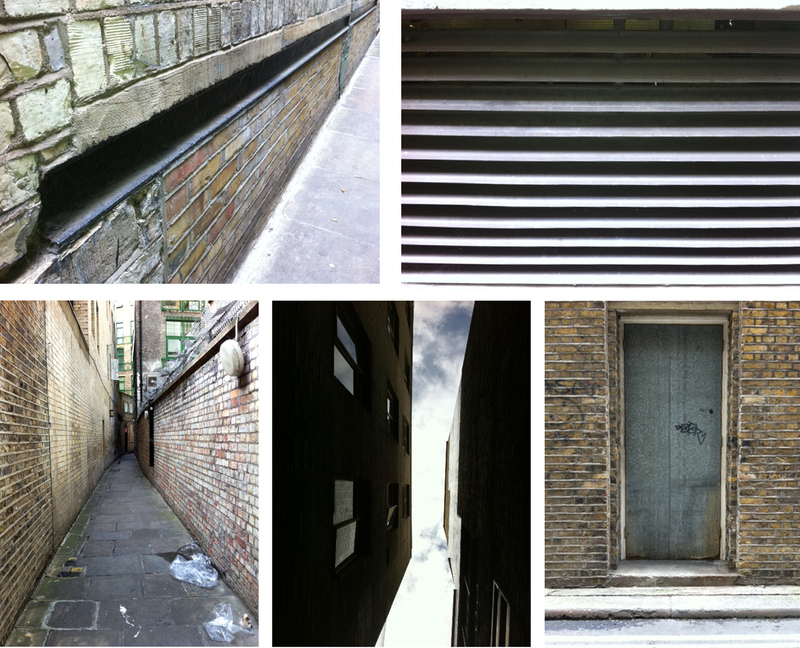 After our initial walk through the London slice, TBC have started to generate ideas for work based in Catherine Wheel Alley, a narrow passageway leading off Bishopsgate to the east. Close to the start of the London slice, Catherine Wheel Alley boasts a somewhat disreputable history as a hangout of highwaymen and work place for prostitutes. Over the next month TBC will be undertaking more research into the area before we start work in the space generating a body of site-specific and performative drawings.